Last year, we saw a baby-cradling mom make an unbelievable catch at a minor league baseball game in Richmond. 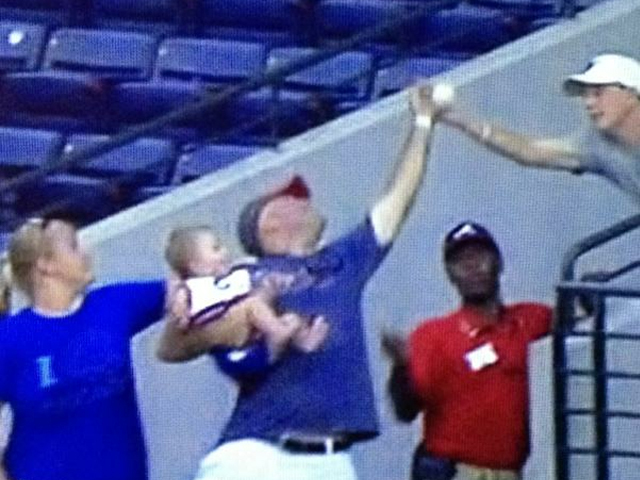 On Monday night in Atlanta, a tot-cradling dad may have made an even more impressive snag. During the sixth inning of the Cubs-Braves game, Chicago's Alfonso Soriano skied a foul ball down the right field line. Watch as a Braves fan holding a baby (wearing Cubs gear) in his right arm makes an amazing bare-handed catch with his left hand, outdueling a toddler-less fan for the souvenir. Thankfully, this guy seemed in control of the baby the whole time - unlike a Dodgers fan last year who was quick to dump his kid for the chance to snag a foul ball. Given the high-degree of difficulty, the Braves announcers seem relatively nonchalant about the whole thing. But Braves shortstop Andrelton Simmons was impressed, applauding the fan in a game that Braves fans had little to cheer about: Atlanta lost to the lowly Cubs 4-1.